The DR181 in a 12-lead configuration provides a high-quality research and clinical evaluation tool. Records 12-lead / 9 channels of data — no short-cuts! 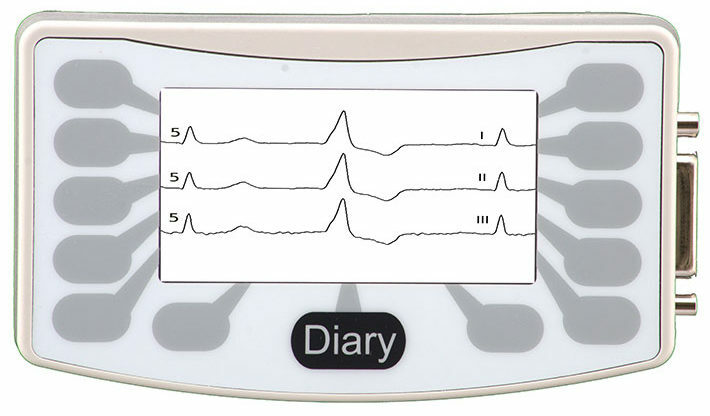 This 12-lead system does not use arithmetically derived or reconstructed data from non-standard Holter lead hook-ups. Intervals from 15 seconds to 5 minutes. The DR181 is the latest version of the reliable and popular DR180 series. The DR181 Holter recorder in a 12-lead configuration provides a high quality research and clinical evaluation tool. It records 12-lead / 9 channels of data – no short-cuts! No short-cuts means that our 12-lead system does not use arithmetically derived or reconstructed data from non-standard Holter lead hook-ups. Those short-cut methods may capture accurate data for normal beats, but the picture degrades sharply for virtually all morphologies of interest. The unit can also be used with 5- or 7-lead patient cables for other applications. The DR181 recorder in 12-lead, can be configured to run in continuous or normal modes of recording, with various options for setting interval times and seconds save per interval.